Rep. Dana Rohrabacher, a bumbling fool and Putin’s top mouthpiece in Washington, got spectacularly owned in an exchange with Yahoo News anchor Bianna Golodryga, whom he accused of bias for being born in the former Soviet Union. Rohrabacher claims he is under consideration for the Secretary of State position under Trump, which would make sense, as he appears aligned with the Trump administration’s intent to get the U.S. nuked to hell. 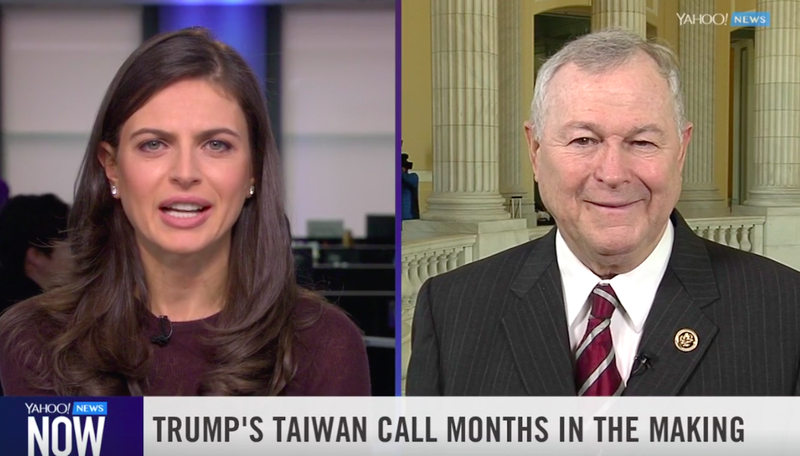 Rohrabacher—who, by the way, once proposed that “dinosaur flatulence” caused previous global temperature fluctuations—was vocally supportive of Trump’s extremely, extremely destabilizing call with Taiwan, replying “absolutely, yes!” when Golodryga questioned whether now is the time to push China away, considering North Korea’s burgeoning nuclear capabilities. “When you talk about human rights abuses in China, much can be said about Russia as well in that regard,” she pointed out. “Oh, baloney! Where do you come from? How can you say that?” Rohrabacher sputtered. “I’m biased because I’m an American citizen who was born in a foreign country?” she asked. That question, as well, provides a mighty struggle for Rohrabacher. I highly recommend watching the whole exchange. It’s very satisfying to watch this self-satisfied geezer flail—if also, you know, incredibly scary!